For the babies between the ages of 8-20 weeks old, Good Dog Training has its Puppy Kindergarten class. While the main objective is to begin to teach your pet the beginning of basic commands, it is just as important for the puppy's upbringing to be involved socially with as many other dogs as possible. Playtime at the class is also an extremely important social setting for the puppies. The length of this course is five weeks and the cost is $100.00 for five lessons. Dog classes are for those pets 6 months through 7 years old. Here, basic commands are instilled in your dogs to where you will have a fully obedient companion. The length of this course is five weeks and the cost is $125.00 for 5 lessons. Rally Obedience is 4 (1hour) sessions for $160.00 plus tax. Private lessons are $65.00 for the hour. During that time, our trainer will evaluate your dog and determine the best course of action for training or behavior modification. For further information on each course's curriculum, please use our contact form. 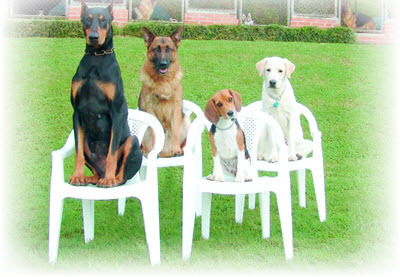 Private In Home basic obedience is also offered, where we come to your house and give one-on-one instruction. This is the fastest and most recognized way to having your dog learn the basic commands. It ensures complete individual attention and much more from a Certified Professional trainer. There are six sessions in this program, with length between sessions varying to make sure your dog has fully grasped what is being taught. The cost of this program is $390.00 plus tax. We also address any behavioral problem your dog may be experiencing. An initial in home consultation is $65.00 for the hour and will cover most general issues. If it is a more complicated behavioral problem, more sessions may be needed. For dogs almost ready to show off, we offer an advanced Off-leash Group class. The cost of going to the shelter to evaluate a dog for a client is $40.00.